(click on image to enlarge)His description here is of the hole as a par-5, and of course this is one of the two three-shotters reduced to a par-4. I had no modern comparison shots with the old image, but this fairway view should be enough. Love the soft, natural fairway lines too! (click image to enlarge)The 15th at Winged Foot features arguably the worst fairway contouring job, leftover from the Meeks 2004 U.S. Amateur setup. Not wide enough to bring the creek into play down the left side or to let a player actually choose an angle to come in from, at least the narrowness doesn't take away from another stellar green complex. Open up the image to read Tilly's proud take on the hole. Below are 1929 and 2005 views of the wonderful 11th, which would be even more fun if included an actual fairway. Yes, the wonderful rolling contours and crowned nature of the hole will be bathed in rough, keeping balls near the centerline instead of taking them to real trouble. Well, maybe that's why this hole will be minus the rough tiers. Remember, this hole is birdieable and we can't allow those! Note the differences in bunkering from then and now, especially in the front left greenside bunker. 1929 and 2005 view of No. 10 at Winged Foot. The photo angles are slightly different, but you can see how the front of the green has changed (I believe raised at some point to stop balls from rolling off). In its original look, the shaping has a settled, rumpled feel. A true work of art. Today, things are a bit more linear and clean, but still pretty awesome, especially with the recent green enlargement. Golfdom's Thomas Skernivitiz profiles Winged Foot superintendent Eric Greytok. Here's some of the restoration work he carried out on the 10th green (you can see the old putting surface boundaries in dark green). (click to enlarge image)One of the best short par-4s in golf will struggle to display its charm when the USGA hides it in non-tiered rough and in general, tries to prevent those pesky birdies. This is one of the three holes where there will be no tiered rough, so tall stuff surrounds the left side fairway bunker 241 off the tee. Ben Crenshaw insists there should be fairway up to and around the bunker. This would encourage leftside lay-ups to obtain better approach angles. And as you'll read in the 1929 National Greenkeeper excerpt, that's how Tilly intended it. But with 22 yards or so of fairway, and no real reason to lay-up on a side of the hole to get a preferred angle at right hole locations, look for some guys to try driving the green. There's a killer back left hole location that the USGA will hopefully use to bring the steep fall off into play (and if the fairway was wide enough, such a hole location would have rewarded right side lay-ups). The third features the new sod farm replica tee courtesy of the Fazio gang, and has been lengthened well beyond the USGA's official 216 yardage. They probably won't be hitting spoons or 2 irons here (as Tilly suggested in '29). But the plan is for the new 240+ back tee to be used once in hopes of forcing someone to lay up like Billy Casper did in '59, all so that NBC can go into a fog-filtered feature on Casper's triumphant decision to lay up and make pars (just kidding). (click on image to enlarge)This is another wonderful green that may not translate to television. And even though it features the left-right bunkering that you'll see on the other par-3's, the green is distinct and loaded with fun hole locations. 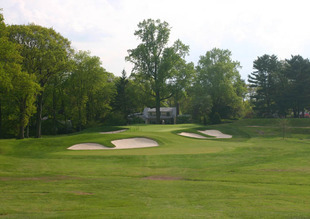 Kicking off what will be Winged Foot's final U.S. Open (unless the USGA does something about distance), I thought it would be fun to look at some of the holes from A.W. Tillinghast's perspective in 1929. This series of articles, photocopied from the old National Greenkeeper magazine, features his hole descriptions and a some old photos. I will try to include some modern shots as well so you can soak up the confining setup. (click on image to enlarge)Anyway, here's #1 from Tilly's point of view, circa 1929. My advice: don't miss it left of the tee. Bomb it as far down the flat fairway as possible, and lay up short depending on the hole location. The green is that wild and maybe one of the neatest in all of golf.